Australian and Chinese university students who want to learn more about Canadian politics have come straight to the source this summer. Eleven students – eight from Australian National University (ANU) and three from different institutions in China – are attending the first-ever Queen’s Political Studies Summer Institute (QPSSI) from July 9-24. A Kingston native and a Kingston adoptee are among 113 new appointees to the Order of Canada announced by the governor general on Thursday. Barbara Sherwood Lollar was born and raised in Kingston, while John McGarry arrived in Canada as a student in 1981, leaving behind the conflict in Northern Ireland at the time. Planning to remain for only a year, McGarry decided to stay and 35 years later is a Canadian citizen, a distinguished professor at Queen's University and now an officer of the Order of Canada. Emma Sawatzky (Artsci’15) had always wanted to study at the University of St. Andrews in Scotland. She was drawn to the school’s strong reputation for international relations and her Scottish grandparents had always told her about the country they’d emigrated from. 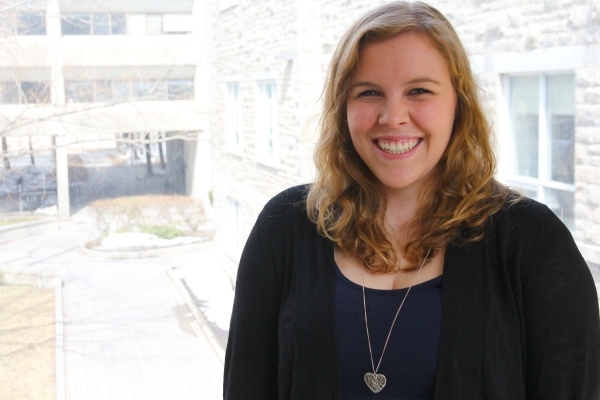 Emma Sawatzky hopes to pursue a graduate degree in international relations. According to a study by Queen’s researcher Christian Leuprecht, if the cost of policing in Canada is to become more sustainable there must be a discussion surrounding the extent of police service and how these are delivered. A debate about the extent and delivery of police services must take place immediately, according to a study by Queen’s researcher Christina Leuprecht.